Newly appointed Indian High Commissioner in Dhaka Riva Ganguly Das yesterday reiterated India’s support to Bangladesh on the Rohingya issue as she paid a courtesy call on Prime Minister Sheikh Hasina. “The influx of over a million Rohingyas is a huge burden for Bangladesh … we will remain beside Bangladesh on the issue,” PM’s Press Secretary Ihsanul Karim quoted the high commissioner as saying while briefing reporters after her meeting with the premier at her Jatiya Sangsad office, reports BSS. The high commissioner said the international community has recognised Prime Minister Sheikh Hasina’s great human gesture of hosting more than one million Rohingyas in Bangladesh. Riva Ganguly conveyed the good wishes of Indian president and prime minister to Prime Minister Sheikh Hasina. She described Bangladesh as one of the important countries and development partners of India. Referring to Bangladesh’s tremendous development in the last one decade under the leadership of Prime Minister Sheikh Hasina, the high commissioner said she was amazed with massive changes and development that took place in Bangladesh. “India-Bangladesh Joint Commission has been activated,” the high commissioner said, adding that New Delhi will continue support in this regard. On the India-Bangladesh development cooperation, Riva Ganguly said such cooperation always remains as a win-win situation for both the countries. About connectivity between the two countries, the high commissioner said economic prosperity will be ensured if the connectivity increases. The prime minister welcomed the new Indian high commissioner, saying that she is glad to see her as the Indian envoy in Bangladesh. 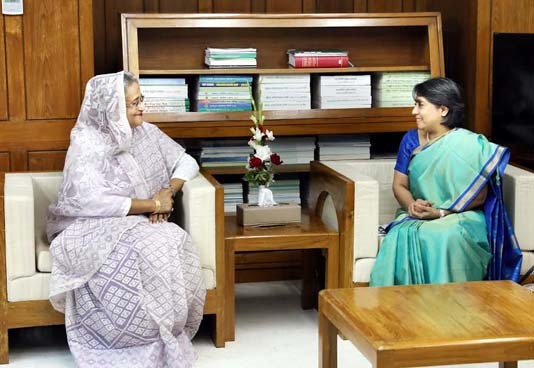 In this connection, Sheikh Hasina assured that her government will extend wholehearted support to the high commissioner to discharge her duties here. The prime minister said the government and people of India are always supportive to Bangladesh right from the days of the liberation war. Sheikh Hasina said Bangladesh and India have resolved the decades-old land boundary dispute. “This will remain as an example and like during our liberation war, all parties supported the bill in Indian parliament to settle the issue,” she said. In this connection, the Indian high commissioner said it can be a model of relations between the two neighbours. Reaffirming Bangladesh’s ‘zero tolerance policy’ against militancy and terrorism, the prime minister said none would be allowed to use Bangladesh’s soil for terrorist acts against any country. Highlighting Bangladesh’s tremendous development over the last one decade, Sheikh Hasina said the main aim of her government is to uplift the country. PM’s Principal Secretary Md Nojibur Rahman and Indian Deputy High Commissioner in Dhaka Dr Adarsh Swaika were present.